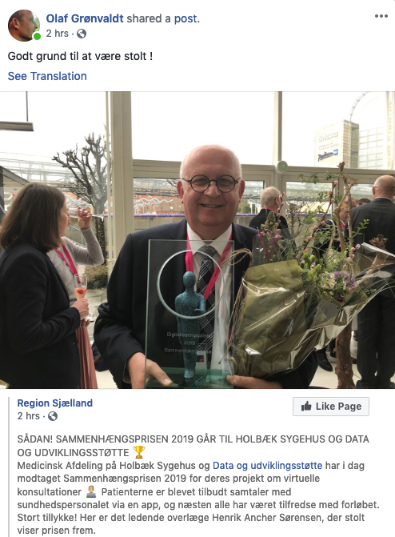 Congratulations to our Danish partner, Viewcare, and their customer Holbæk Hospital, for winning the prestigious Digitaliseringsprisen (Digitization Prize) for 2019 for their Virtual consultations project built on the SBR Health platform. With virtual consultations, Holbæk Hospital has made their interdisciplinary health efforts available at the individual citizen. The solution is thought from the outside, with the patient as the starting point. It connects citizens, relatives and healthcare professionals across specialties and geographical location. Citizens save transportation time and can have the consultation where they like, the region saves transportation costs and the consultations become more targeted and efficient. Starting with version 3.3.40, the SBR Health mobile applications support Push Notifications. This is a feature of the iOS and Android platforms that allows the SBR server to send messages to the mobile client even when the device is asleep or the SBR app is not running. Because the messages are sent via servers at Apple and Google, the battery consumption is very minimal. A patient checks in for a scheduled appointment or submits a request for an on-demand visit. If the provider has the application open, the device makes a ringing sound and displays the patient information as usual. If the application is in the background or the phone is asleep, the phone beeps and displays a notification. If the app is not running at all, but the provider has previously logged in from that device, a notification appears in the device’s notification area. In any case, with one click, the provider can answer the call. A provider makes a virtual Rounding call to a patient. If the patient has the application open, a dialog box opens as usual asking if the patient wants to accept the call. With push notifications this can happen even if the phone is in the patient’s pocket. A provider wants to call in a colleague for a consultation. Pressing the button for that colleague will cause his or her phone to beep and display the request even if the phone is asleep. Pressing a button for a specialty will try each of the on-call specialists, whether their phone is in the foreground or background. Each user can opt in our out of push notifications and they can be turned on or off for an entire institution. And of course the SBR product continues to provide the previous notification methods, such as customizable email templates, pager alerts, and text messages. 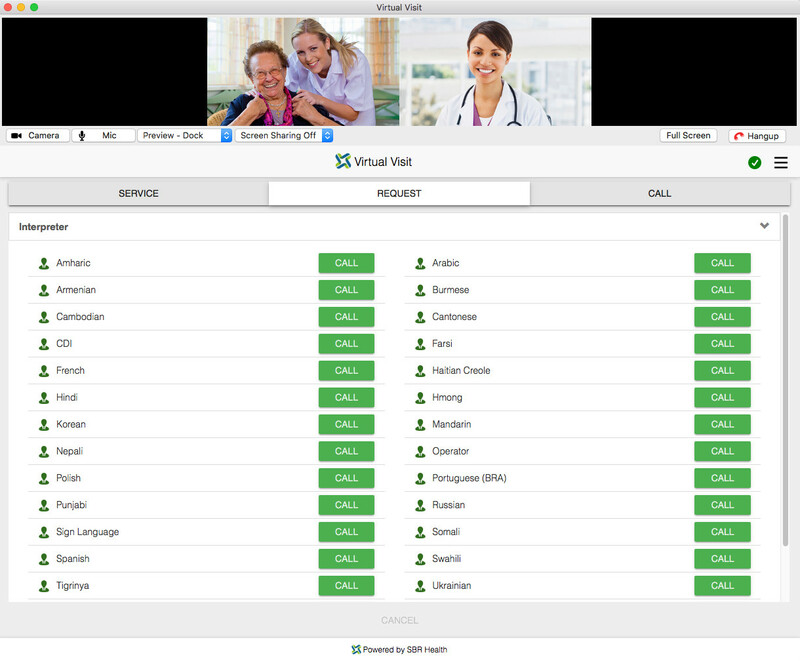 We have partnered with InDemand Interpreting to provide interpreters within any SBR Health virtual visit. Whether you are running an international medical program or serving a local population with limited English proficiency a single click gets you one of InDemand’s medically qualified interpreters within seconds. No reservation or advance notice is required. You can call the interpreter before you connect with the patient or add an interpreter at any point in a patient visit. To add an interpreter, go to the Requester tab to select the language from the 28 that are offered. Within 10 -15 seconds an interpreter will be added to the call. This feature is available to all SBR Health customers but does require establishing an account with InDemand. Contact your SBR representative for details. We would like to welcome VillageCare Wellness Innovations to our family of customers. VillageCare recently received a Health Care Innovation Award from The Center for Medicare and Medicaid Services Innovation Center (CMMI) to pilot “Treatment Adherence through the Advanced Use of Technology” (TAAUT). This program aims to increase patient activation and treatment adherence for people living with HIV and AIDS by providing a multi-faceted intervention involving a social platform for behavior change, virtual visits, text reminders and peer support. VillageCare Wellness Innovations expects to improve adherence in the most cost-effective manner by delivering education and support through technology. Participants will be able to access a customized private social network, virtual video support groups, treatment adherence professionals for questions, and text messaging for medication and appointment reminders. In addition, peer mentors will provide one-on-one encouragement and mentoring for behavior change. The overall goal of the program is to improve viral loads and CD-4 counts, thereby simultaneously improving health and reducing overall health spending for the population. VillageCare was awarded just over $8.7 million to create and operate this program for three years. CMS will be conducting evaluations during and upon completion of the pilot program. More information may be found by visiting www.villagecare.org. The project described is supported by Grant No. 1C1CMS331353-01-01 from the Department of Health and Human Services, Centers for Medicare & Medicaid Services. The contents of this publication are solely the responsibility of the authors and do not necessarily represent the official views of the U.S. Department of Health and Human Services or any of its agencies. While studies have shown that successful use of videoconferencing and real-time communications can profoundly benefit patients and doctors alike, how do we define success? Telemedicine has been in use now since the 80’s but due to complexity, specialized equipment, expensive network infrastructure and poor Medicare/Medicaid reimbursement policies, it remained limited to a small number of users. These challenges made it impractical to use televideo technologies for care delivery on a larger scale. 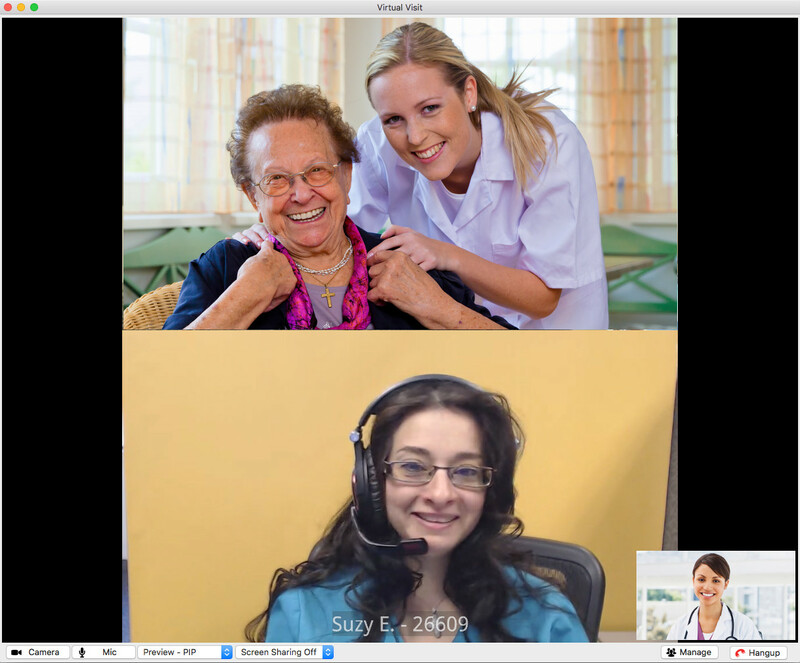 Today, low cost and ubiquitous technologies do exist that can facilitate a world in which videoconferencing has a place on the desk of every doctor, nurse and clinician. However, what is needed at the clinician level are applications designed specifically for the health care industry with televideo as a method of communications. As studies have shown that health care outcomes improve when truly collaborative communication takes place among patients, doctors and specialists, televideo is becoming more mainstream. But for televideo to be both successful and effective, televideo technologies must be user friendly, highly secure, low cost and fully customizable. Fixing televideo goes beyond cost and complexity. While there are a number of innovative televideo technologies, there is still the problem of integrating televideo seamlessly into clinical workflow. The success of any technology depends only 10 percent on the technology and 90 percent on how the technology is integrated with existing workflows. To deliver care successfully and effectively across the healthcare continuum, televideo must be mapped to existing workflows to improve patient and clinician use experiences and to minimize change management issues. Change is good but it’s not always great. To make televideo great, let’s start with improving the usability. Everything is moving to mobile these days, and healthcare is no exception. Christopher Herot, co-founder and CEO of SBR Health, is a recognized business and technology leader who has spent years developing and evaluating video, mobile and real-time video communications solutions. In this one-on-one interview, Chris shares his thoughts and predictions for how mobile technology will transform the healthcare space and beyond. From how we buy care to keeping in touch with family, mobile’s intersection and influence on our daily lives is significant. How have you seen this shift? There was a time when every young ambitious professional had a day planner. The iPad is now the equivalent. It’s your phone, calendar, email, entertainment, and computer – your method of communication for everything. This has really transformed a number of industries. Retailing is now different. People can do comparison-shopping using their phone. It’s even changed travel to some degree. You can get your boarding pass on your phone and check into places on Foursquare. For the longest time, it looked like healthcare was not a tech-savvy field but this is quickly changing. What role does mobile play in the healthcare space? iPads are taking the medical world by storm. They’re just the right form factor for healthcare. Apple reimagined what you can do with a tablet and has provided for an entirely new experience. Doctors don’t want other tablets. They want the iPad. Some thought early tablets failed in terms of usability based on size but Apple demonstrated it wasn’t just about size but more about the user experience. There’s something truly unique about being able to type medical information while looking at your patient. This increases physician-patient engagement. There’s proven clinical value. Tablets have given doctors better access to tests and other medical information. A recent study published in the Archives of Internal Medicine found that iPads help doctors be more efficient at ordering tests and procedures for their patients. My thesis is that iPads allow physicians to do more in real time and make healthcare more convenient. The real and long-term benefit of mobile technology is in bending the cost curve in healthcare. This goes beyond getting doctors to accept lower fees and cut down on unnecessary tests. The bulk of the cost is to get Americans to stop eating so many donuts. The way you make people healthier is to make it easier and convenient for people to see their doctor. This will drastically cut healthcare costs. The demand for mobile reflects where we’re at as a society. The doctor is not always in his office ready to take your call, and so many of us are on the go. Being able to get access to the healthcare system wherever you are – work, home, out and about – is really critical. To make that work, we have to be able to see the patient and share what we see with other people. Tablets are small enough to be portable but also have real data on the screen. How will this be adopted? It will happen fastest where the payment model is evolving away from the fee for service. You’re seeing this with concierge practices. Once you make it easier for patients and doctors to do a virtual visit, I expect the adoption will expand to other parts of the world. There are places like the payers and insurance companies who see this as a way to improve healthcare delivery. You’ll see this first in places that have the luxury of not having to worry about restrictions. Concierge and post-acute follow up are prime examples. 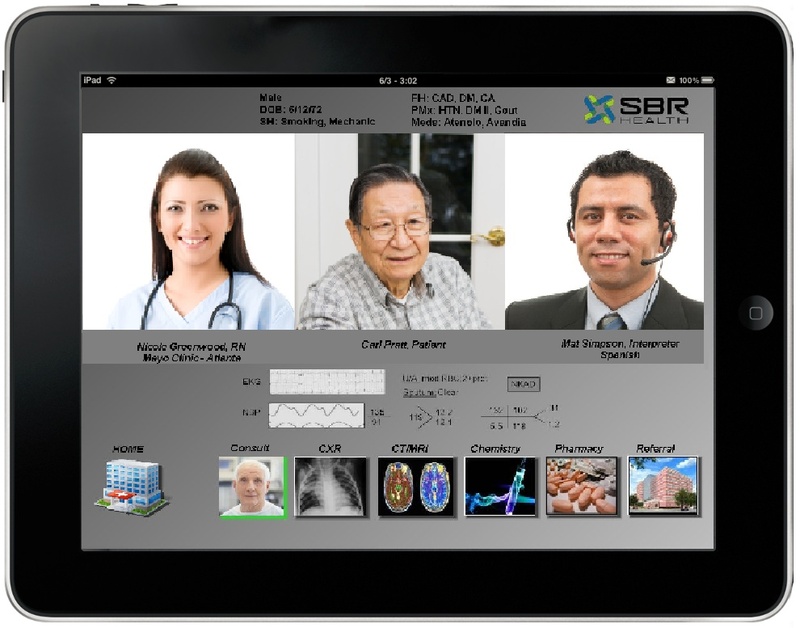 SBR Health is developing the technology that will enable videoconferencing and real-time communications to benefit patients and doctors alike. Healthcare outcomes improve when collaborative communication that’s convenient takes place among doctors, specialists and patients, and we’re working to make it as simple and secure as possible. As we start a new year, I looked back on all that we learned from the hundreds of conversations we had with doctors, patients and hospital administrators to pinpoint the top lessons that really stood out from 2011. There was a lot of frustration with the fee-for-service model and the fragmented care that it engenders, but there were a few points of concern that surprised us that I thought I would share with our readers. When we asked patients what they wanted from their doctors, we heard they wanted someone who would really listen, take them seriously, and didn’t keep them waiting. When we talked to doctors, we learned they were frustrated by patients who didn’t show up for their appointments, follow up with their treatment plans or take their medications. While it is often said that anecdotes don’t equal data, there are corresponding statistics on the sorry level of readmissions, which can often be traced to a lack of coordination among caregivers and the need for patient engagement. As we looked into where video communication might help, we observed that video had two very different roles to play in medicine. The obvious role, as pioneered in dermatology and neurology, was using video as a diagnostic tool, for example looking at a photograph of a patient’s skin or observing his performance in a neurological examination. The other role, which may be equally if not more important, was more of a consultative role to establish rapport and engender trust between the parties. Doctors refer to the “doorknob syndrome,” where the patient mentions the most significant problem as he has his hand on the doorknob to leave the room. As this is something that occurs most likely in person and least likely over the phone, video is more like being there in person. Video, like an in person visit, ensures a higher level of trust between the patient and doctor. We also heard a lot from hospital administrators about “change management.” Doctors are avid consumers of technology, from surgical robots to smart phones, but they have little patience for tools that are supposed to help and instead create more work. Electronic medical records (EMR) are a case in point. Implementation of an EMR can cost millions (or even billions in some cases) but we have yet to encounter a health care professional who hasn’t expressed frustration with one. Enterprises everywhere need to deal with the high level of expectation conditioned by consumer IT, and health care is no exception. When it comes to video communication, the technical requirements are pretty straightforward: high quality, low bandwidth, interoperability with existing systems, and straightforward user experience. While there may not be one technology that satisfies all those requirements at once, we at SBR Health see an opportunity in crafting a solution that combines the best of the available video technologies with applications that are compatible with the day-to-day workflow of busy clinicians, improve communication among clinicians, patients and family members, and enable more efficient and compassionate delivery of health care. Chris Herot is the CEO and co-founder of SBR Health. Prior to launching SBR in 2010, Chris was Chief Product Officer at VSee Lab, a provider of high quality, low bandwidth and low cost videoconferencing solutions to enterprises and governments. Chris has been a successful business and technology leader in several high growth companies, and directed the advanced technology group for several years at Lotus Development (now IBM) where he was responsible for video, mobile and real-time communications solutions. Chris received his BS and MS degrees from the Massachusetts Institute of Technology where he was on the faculty of the group that became the MIT Media Laboratory. SBR Health is chosen as a BluePrint Health IT finalist. 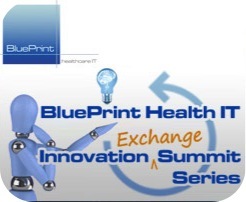 SBR Health is proud to be one of 10 finalists chosen from more than 40 applicants for the BluePrint Health IT Innovation Exchange Summit, an event dedicated to accelerating innovation and adoption of transformative, healthcare IT solutions nationwide. The summit will bring together cutting-edge, healthcare providers with innovative, early-stage healthcare information technology companies to showcase and accelerate eHealth innovation across the nation. Modeled after speed dating, the event introduces technology companies and leading healthcare providers in short 15-minute meetings with the goal of creating the ideal match and fostering a pilot project. Participants start the day by attending seminars on how to foster a successful relationship. Following the meetings, attendees will participate in the preliminary round of 10 introductory sessions. In the afternoon, companies will engage in two longer meetings with the intention of outlining a framework for a potential project. 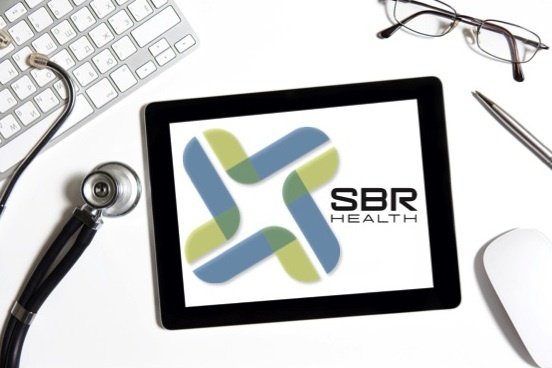 The SBR Health team is looking forward to connecting with Midwestern hospitals to help them find ways to leverage the benefits of telemedicine among their patient population. Make sure to follow us on Twitter as we engage with some of healthcare’s leading innovators at the summit.